The zoo is a great date location, since there's always something to talk about there. You'll definitely get your hands dirty. We were on a mission go to happy hours along the street car route. Friends and family were invited to try the Royal Room on Saturday night. New flooring has been installed throughout. Roomier galleries will allow the TMA to show off more works from its 9,000-piece permanent collection. “We are using our space better,” says museum Director Jeremy Mikolajczak. Tucsonan Gina Beca looks out over the city from Windy Point Vista on Mount Lemmon. This would make a lovely spot to watch the sunset with your loved one. Crowds streamed across the rocks at Windy Point Vista in the Catalina Mountains on July 14, 2017. The Mount Lemmon road opened today after a week of closure due to last week’s Burro fire. Crowds flocked to take in the sites. The Still is a 700 square foot speakeasy style bar accessed via a secret door. Las caminantes de Tumamoc tendrán pronto una nueva forma de disfrutar su paseo: una aplicación telefónica. La nueva app, tanto para sistemas Android como iOS, tendrá seis secciones que irán narrando el ascenso al cerro, en ambos idiomas. Dancers with Tucson's Compania de Danza Folklorica de Arizona perform on the Alameda St. stage during opening day of the 44th edition of Tucson Meet Yourself in Tucson, AZ. on October 13, 2017. Flamingos tuck in for the evening. If you're just hanging out or going out for the first time, you don't want a date that says 'I love you'. On the other hand, if you ARE serious, you want to show it. That's where we come in, friends. We've got Tucson date ideas for every situation, from the casual Tinder hookup to the super serious 'I want to marry you' date. We're also including lady date ideas for you and your squad. Get pampered. Pick any á la carte service including manicures, pedicures, facials, massages and waxing services using organic and vegan products at Greentoes, 529 N. Sixth Ave. Manicures start at $27. Nights like this are fun because you get to create something to take home AND have drinks with your friends. 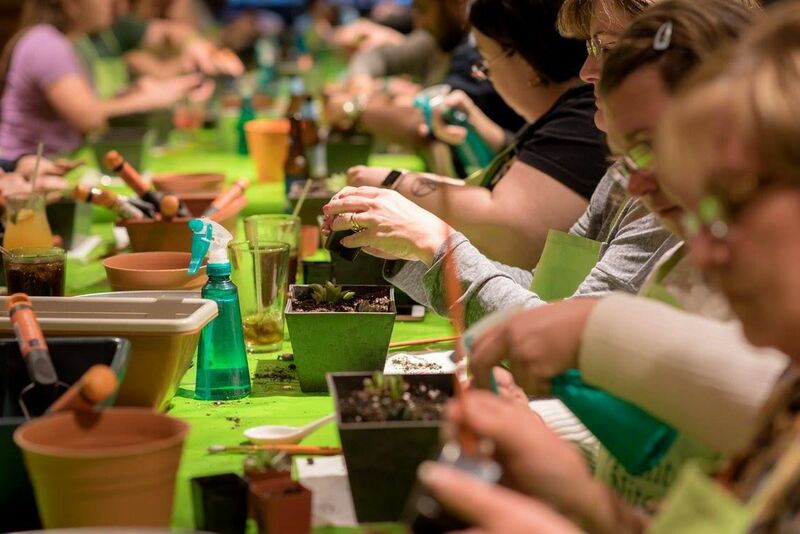 Plant Nite is pretty much the same concept as paint and sip parties. Your registration fee covers supplies and instruction. Bring your BFF and some money for drinks. Several events are planned each month at various restaurants and bars around Tucson. Click here to start planning. If you just want to go to all the bars and enjoy all the drinks with your besties, make your own bar crawl using the street car. We did and it was so much fun. We parked at the Mercado and took the street car all the way to University Bouldevard, stopping for drinks along the way. Day passes for the streetcar are $4.50. It was great not having to drive. Just make sure you sober up by the time you get back to your car. You can use our itinerary or make your own. The casual, first-meeting type of date should be fun and no-pressure. Pick places that make you feel relaxed and ready to have a good time. You want a place that's kinda cozy but not too romantic by traditional standards. That's what makes The Royal Room, 450 N. Sixth Ave., perfect for a casual date (or for any date, really). It's fun, hip and intimate enough to get to know each other a little bit. They have wine, beer and food. Pro-tip: If you go on a Wednesday, there will be a DJ. Click here for more info. From 4-7 p.m. Monday-Friday, Hotel Congress, 311 E. Congress Street, hosts happy hour with $5 specialty cocktails and yummy bar eats. It has several different bars including the Tap Room, lobby bar, Club Congress and on the plaza. Pick whichever suits your mood. If you want a daytime weekend date, check out the Bloody Mary Bar from 10 a.m. to 2 p.m. every Saturday and Sunday. Get to know each other without the awkwardness of trying to find something to talk about. So, go somewhere that offers lots of conversation starters or fun activities. Museums are great because there's stuff to talk about everywhere, making it less awkward if you can't think of anything to say. Look at art at the Tucson Museum of Art, 140 N. Main Ave. You can get lunch at Cafe a la C'Art and shop in the gift shop. Pro tip: Admission is free from 5-8 p.m. the first Thursday each month. Click here for details. The Reid Park Zoo, 3400 E. Zoo Court, is fun to wander this time of year when it's not so hot. It's also large enough to take a couple hours, but small enough to where you're not stuck on a date that isn't amazing any longer than you have to be. Click here for details. Whether it's an art festival, street fair or food fest, these are great for dates because there's so much to see and do that there will always be something to talk about. Plus, it's a good way to get to know somebody. You'll see what types of things and food they're drawn to. 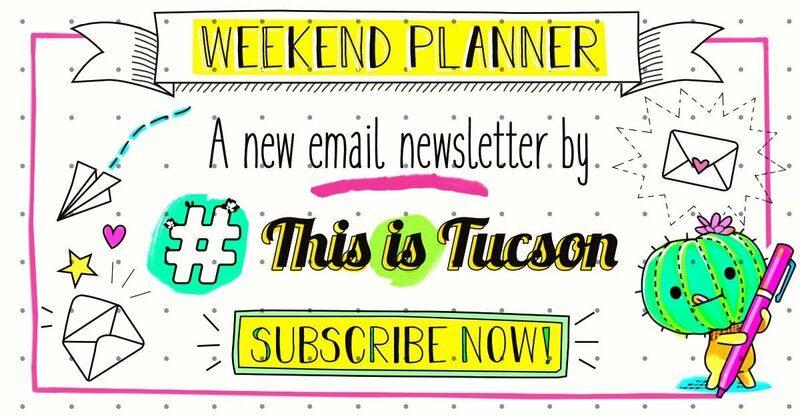 You can go to Second Saturdays downtown or click here for some of Tucson's biggest events. When you've been seeing each other for a while, you've got to get creative to keep dates fun and romantic, especially if you're serious about this person. Laughing together is a great way to bond. And, you don't even have to say much to make that happen. Go to the Laffs Comedy Club, 2900 E. Broadway for a funny night of comedy. Get there early and have bad food and a drink or two. Showtimes vary, but are typically on Thursday, Friday or Saturday nights. Check here for a schedule and info. P.S. This is also a great married date! The gardens, located at 2950 N. Alvernon Way, are romantic in the evenings with gorgeous scenery and dim light. The restaurant on the premises, Cafe Botanica, is open from 5-8 p.m. Thursday and Friday evenings, making it the perfect date destination. Call 326-9686, ext. 37 for reservations. See the city from up high on top of Tumamoc Hill. It's a little work to get to the top, but your payoff is gorgeous views of the city. The road up and down the hill is paved and gains about 700 feet in elevation in about a mile and a half. Pack a picnic and enjoy the sunset and goodies with your date. It's west of downtown and "A" Mountain, near North Silverbell and West Anklam Roads. Click here for a map. Have fun. Play laser tag, mini golf, arcade games, go-kart racing and bumper boats at Golf 'n Stuff, 6503 E. Tanque Verde Road. There's a date coupon that includes two all park passes good for one round of mini golf, four ride tickets and four arcade tokens, plus two drinks and a large popcorn for $40. This is for when you want them to KNOW how much thought you put into the night. You want them to KNOW they're the one. If you've always wanted to surprise your love with an epic date, this is the time to do it. Go all out for a once in lifetime experience or opt for something simple, yet so romantic there will be no doubt about how you feel. If you're gonna pop the question or just want to have an epic, unforgettable night (or day), check out Volare Helicopters. The company has different options, like Mount Lemmon, Saguaro National Park or Downtown Tucson for helicopter tours. It also has a special Proposal Flight which comes with champagne, a photographer and video footage. Click here for more info. You'll never forget popping the question or declaring your love while coasting over our beautiful desert and mountains from a hot air balloon. Tucson Balloon Rides offers a 'Sonoran Sunrise' flight followed by champagne and brunch. You'll also get pictures from your flight. If staying on the ground is more your style, no worries. We are surrounded by gorgeous mountains and landscapes that would be the perfect backdrop for a romantic evening. Windy Point Vista, about 14 miles up on Mount Lemmon, is a beautiful place to watch the sun set behind our lovely city. Sneak your partner's favorite snacks and a blanket in the car and head out, giving yourself enough time to drive up there. (Maybe go in advance to find your perfect spot to see how long it takes you to get there). Once you're there, set up your spread and enjoy. Your date will love how much thought you put into it and it's oh so romantic. Just because you've been married for a while doesn't mean the fun stops. Keep dating your spouse. It'll keep the romance and adrenaline flowing. Add a little mystery back into your life by going to a secret bar. The Still is a speakeasy-style spot hidden in a restaurant. We're not gonna tell you where it is, though. What fun would that be? Text 909-6299 to make reservations and find out where to go. Need a little adventure in you life? Arizona Zipline Adventures, 35406 S. Mt. Lemmon Road, offers what they call Zipline EcoTours. Basically, you hike a little and zip. Each tour takes about two hours with up to six people per group. You'll get to ride on five ziplines which range in length from 400 to 1,500 feet. You have to book a reservation in advance, so make sure and do that. It costs $79 each. Pints and Poses is a laid back yoga class at Puebla Vida Brewing, 115 E. Broadway, followed by a cold pint. It's at 10:30 a.m. Sundays and costs $5. They also host kids crafting sessions for $5. Time to train your muscles and endurance for Tucson's spring races. Run for fun with friends and family and memorable moments. South Fourth Avenue is home to some pretty cool places that make nice date spots on their own or combined for a special date night. Break out of your date-night routine of dinner and a movie and go play instead.